The benefit boasted the best audience ever for the annual event, with nearly 450 wine and food lovers attending. 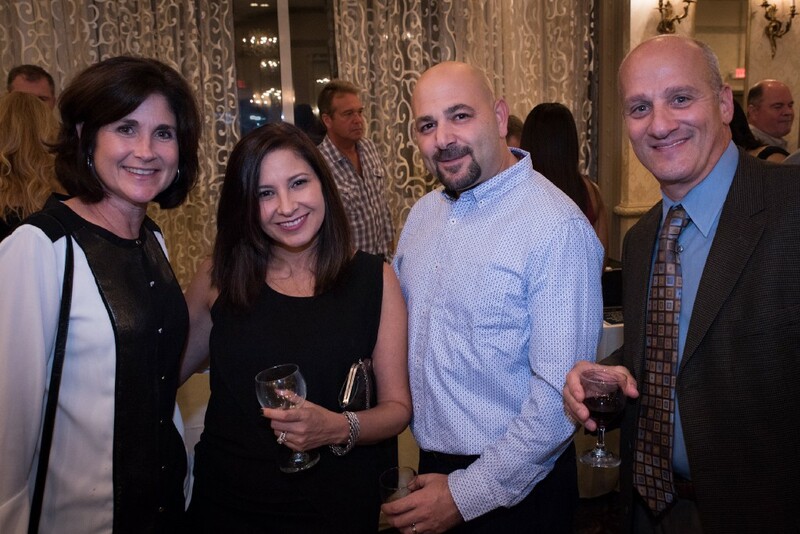 Left to right, Lauren DeLorenzo and Rachael Wittman of CareOne Harmony Village in Moorestown, Darren Wittman and Joseph DeLorenzo of Moorestown at the Moorestown Visiting Nurses & Hospice’s annual Benefit “Spirits Night” on Friday, Oct. 21. Moorestown Visiting Nurses & Hospice held its annual Benefit “Spirits Night” at The Mansion in Voorhees on Friday, Oct. 21. The benefit boasted the best audience ever for the annual event, with nearly 450 wine and food lovers attending. Presented by Benash Liquors of Cherry Hill, nearly 35 tables of wine, beer and spirits samples were offered to guests. Crowd favorites among the hundreds of available tastings were samples from South Jersey’s own Lazy Eye Distillery, Valenzano Winery, Double Nickel Brewing Company and Petty Island Rum. Plentiful food and dessert samplings by many top area chefs, bakers and caterers were also available. Local eateries participating this year included: Harvest Seasonal Grill, Seasons 52, Firebirds Wood Fired Grill, The Mansion caterers, The Chop House, Miller’s Ale House, Marco’s, Fresh Grill Catering & Paella, Cibo by Illiano, A Taste of Olive, Roly Poly, The Traveling Vineyard, Sweet Eats Bakery and Dunkin Donuts. Chefs from Lutheran Crossings in Moorestown, Springhill Home Care in Cherry Hill and Cherry Hill 5-Star Senior Living were also on hand. The event benefit Moorestown VNA’s patients in charitable home care, hospice and counseling programs. Contributing to the proceeds this year were major sponsors Rothamel Bratton Attorneys at Law, Five Star Senior Living, Heritage Business Systems, Mainline Medical Supplies, McKesson and Sun Bank. Plans are already underway for the organization’s next fundraiser, a golf tournament held each year in June at Laurel Creek Country Club. The largest independent, non-profit agency of its type in South Jersey, their mission is to provide a full continuum of home and community-based health care services that promote optimum quality of life, independence and dignity; to teach people to care for themselves and each other; and to provide skilled home care, counseling and hospice services to their patients in need. Specialized services of Moorestown VNA include oncology care, wound care, telehealth/heart failure programs, IV nursing, palliative care, palliative care physician consult services, occupational, physical and speech therapies, behavioral health and supportive services for grief and loss. The agency is also home to the Community Counseling Center, serving children, teens, adults and the LGBTQ community. To find out more about the agency, contact (856) 552–1300, e-mail services@moorestownvna.org or visit online at http://www.moorestownvna.org and facebook/moorestownvna.